Hello. My name is Biscuit. I've been here before at Killer Characters, but not for a long time. I'm a dog, part of Carrie Kennersly's family. She's the human whose stories are being told in the Barkery & Biscuits Mysteries. This has been going on for a while. 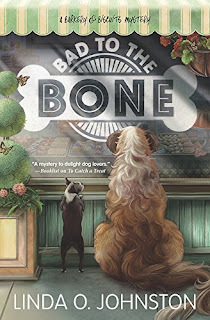 The third book, BAD TO THE BONE, is going to be published, whatever that is, in May. All I know is that I've been happy to be hanging out nearly every day in Barkery and Biscuits, the great shop where Carrie sells dog treats she bakes from recipes she created as a veterinary technician. It's right next door to her shop where she sells human treats, Icing on the Cake, but I'm not allowed to go into that one. But the Barkery? I love her yummy dog treats, and I get to sample them. A lot. Plus I meet other dogs who are brought in by their people to also get treats, and the more they buy from Carrie, the longer we'll be able to keep the Barkery going, which is fine with me. One problem, though, is that too many humans seem to be getting killed by other humans in our nice little town of Knobcone Heights. If that wasn't bad enough, my Carrie keeps getting involved in trying to figure out what nasty human did the killing. That's partly because the detectives investigating the first murder thought Carrie did it so she had to make sure they learned the truth: it wasn't her. And that meant she had to prove to them who it was. And she helped to clear a friend in the second story who was also what humans call falsely accused. The same kind of thing happens in BAD TO THE BONE, I'm told, to another friend of Carrie's who's thought by those not-so-smart detectives to be the killer, His name is Jack Loroco, and he's visited us a lot of times. He's a guy who wants to buy recipes from Carrie for some of her best dog treats. I can understand that. And I can also understand why the nasty human who works with him, a woman named Wanda Addler, is the person who gets killed. Meanwhile, Carrie's holding adoption events for Mountaintop Rescue in the Barkery, and that's the wonderful shelter that saved me so Carrie could adopt me. Oh, and I want to be sure to mention her brother Neal, who lives with us. He's a nice guy, and he always calls me "Bug." I'm not a bug. Like I said, I'm a dog, and people say I'm a mix between those they call toy poodles and those they call terriers. I'm gold in color, and my fur is fuzzy. And though there are lots of other humans in our lives, I want to particularly mention Dr. Reed Storme, a veterinarian that Carrie sees a lot, even outside the vet clinic where she says she works part time as a vet tech. I like him, and I even like his dog Hugo, who's bigger than me. Anyway, like the last time I barked here, I want to tell you that this latest story of hers is also worth reading, even though I don't know how to read. But I'm still her friend and protector and treat-sampler. And you're still invited to stop by our stores and buy people treats for you and dog treats for your best friends. BAD TO THE BONE, the third Barkery & Biscuits Mystery by Linda O. Johnston, will be a May 2017 release from Midnight Ink.